One of the common misunderstandings when programming the EV3 is that if you turn the motor “On”, the robot will just start moving. This mini-challenge is to make beginners aware of what the “On” mode does on the EV3. Explain to them that this is a motor block on the EV3 and that the first parameter is set to “On” mode. Ask them to predict what the code will do. 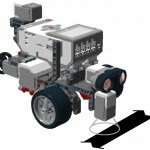 Most students new to programming with the EV3 will say that the robot will move forever. Have students create this code, download it, and test it on their robot. Have them compare their predictions with the actual results. Simply turning “On” the motor does not result in the robot moving. The “Motor On” block is used to run the motor while you play the block that comes after it. The motor will run until the end of the program or a “Motor Off” block. In the code given to the students, there was no block after the “Motor On”. Therefore, the program ended immediately and robot did not move. To check comprehension, show students the next two pieces of code and ask them what the code does. I have 4 EV3 bricks and 2 will only run “motor on” (when followed by another step like a sensor wait & motor off). The other 2 will not turn on the motor with the same programming. Instead I have to put the “motor on” in a loop (with a sensor to tell the loop when to stop). Any ideas why they work differently? All have the same firmware. It makes it challenging to use them in a class when they act differently. Thanks! Would you be able to share the code you tried on the bricks with us? It is certainly strange to have the 2 bricks behave differently if you are running the same firmware and code on all 4 bricks. Thanks.